If you have an expensive Compact Digital Camera you need to protect it with a stylish, yet light, case. The LUPO soft Camera Case ticks all those boxes. Classic looking Compact Bag, which is ideal to store a point-and-shoot camera, memory card(s) and small accessories. Soft Shell Protective Compact Digital Camera Case with Belt Loop and Neck Strap. Slim and small to carry. High quality, compact, lightweight, extremely durable material. Protects your camera against damage, dust and scratches. Note: Please measure your camera to make sure the size of Camera Case fit your camera before ordering. 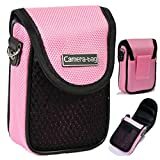 This entry was posted in Discount Photography and tagged Belt, Camera, Case, Clip, Compact, LUPO, Pocket, Pouch, Shockproof, Soft, Strap, Universal by Ball Photo. Bookmark the permalink.